Felix Baumgartner now holds the world record for the highest ever free-fall and in doing so became the first jumper to break the sound barrier. 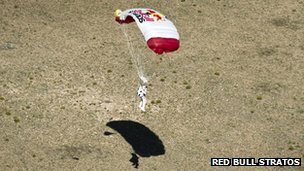 The Red Bull Stratos team, which Felix is part of, gave the go ahead for the jump on Sunday. Some how the location of Roswell seems fitting for the jump.